Kidderminster Harriers have announced first-team coach Tim Flowers is leaving the Conference Premier side to take up a position with a Football League club. Former England goalkeeper Flowers, 47, has been part of Harriers boss Gary Whild's coaching set-up since March. "To be able to coach and train with the lads every day was great for me and I thoroughly enjoyed that," Flowers said. "Under any circumstances I would've liked that have continued, Kidderminster is a tremendous club." Flowers' playing career began at Wolves and included spells at Southampton and Blackburn Rovers, where he won the Premier League title in 1995. He also won 11 caps for England and was part of the squad at Euro 96 and the World Cup in 1998. As a coach, Flowers spent time as Iain Dowie's number two at Coventry City in 2007, at Queens Park Rangers the following year and in the Premier League with Hull City in 2010. 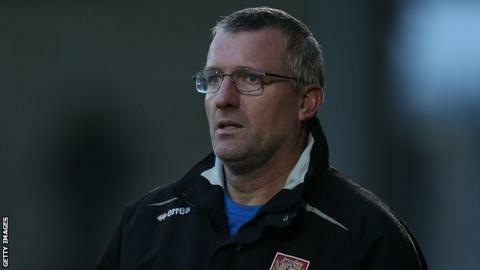 He tried management with Conference North side Stafford Rangers, before taking over briefly at Northampton Town following Aidy Boothroyd's sacking in January this year. After a stint on the Cobblers coaching staff, Flowers left to take up his position at Aggborough and admits leaving will be difficult. "It's a beautifully-run club from the chairman down and it's been a pleasure to get to know everyone so well," Flowers said. "I'd love nothing more than for them to get back into the Football League where they belong, because it's a league club in terms of how it's run and the potential of its fan base." Meanwhile, former Harriers defender Mark Creighton, who has been working with Flowers alongside Whild, has agreed a deal to stay at the club as assistant boss for next season.